After around-the-clock work to resolve concern about suspect hydrogen valves, the shuttle Discovery is set for launch Wednesday on a four-spacewalk mission to attach a final set of solar arrays to the international space station. The huge solar panels, stretching 240 feet tip to tip, are the last major U.S.-built station components scheduled for launch on a space shuttle. The first of five missions planned for 2009, STS-119 also will ferry Japan's first long-duration station flier - shuttle veteran Koichi Wakata - to the lab complex and bring flight engineer Sandra Magnus back to Earth after four months in space. Launch is targeted for 9:20 p.m. EDT Wednesday, roughly the moment Earth's rotation carries launch pad 39A into the plane of the space station's orbit. Forecasters are predicting a 90 percent chance of good weather Wednesday and Thursday, decreasing slightly to 80 percent on Friday. "The vehicle's looking real good, the weather's looking real good," Mike Moses, chairman of NASA's Mission Management Team at the Kennedy Space Center, told reporters today. "I need a piece of wood to knock on, but I think we've got a really good shot Wednesday." Joining Wakata aboard Discovery will be commander Lee Archambault, rookie pilot Dominic "Tony" Antonelli, shuttle and station veteran John Phillips, and spacewalkers Steven Swanson, Richard Arnold and Joseph Acaba. Arnold and Acaba are former school teachers, selected as "educator-astronauts" and following in the footsteps of Barbara Morgan, Christa McAuliffe's backup in NASA's original Teacher in Space program. But unlike McAuliffe and even Morgan, Arnold and Acaba will have no time for teaching. "When Steve Lindsey, the chief of the (astronaut) office, assigned both me and Ricky to this flight, he wasn't looking at hey, we're going to fly two teachers," Acaba said. "He was looking for astronauts to fill the slots with a certain skill set and I think we fill those. These guys treat us like anybody else and everybody else in the office has been very supportive of the program. So it's been great." Archambault is making his second flight and his first as commander. Swanson also is making his second flight while Phillips, veteran of a long-duration station tour of duty in 2005, will be logging his third space mission. Assuming an on-time liftoff, Archambault will guide Discovery to a docking with the space station around 6:30 p.m. on March 13. The shuttle astronauts will be welcomed aboard the station by Magnus, commander Mike Fincke and flight engineer Yury Lonchakov. Swanson and Arnold plan to stage a spacewalk two days later to attach the new solar array truss segment. Three more spacewalks by Swanson, Arnold and Acaba, working in two-man teams, are planned for March 17, 19 and 21. Undocking is targeted for March 23 with landing back at the Kennedy Space Center expected around 3:27 p.m. on March 25. Computer modeling and detailed metallurgical analysis now show cracks are unlikely to develop and propagate to failure in a single flight and that even if a failure occurred, large pieces are unlikely to break away. In addition, impact testing showed the plumbing can withstand hits from the sort of debris that would be released in a valve failure. Finally, a detailed study of the consequences of an impact puncture in the pressurization line showed much larger debris would be required to cause pressurization or flammability issues. "So we really attacked this problem from all the different areas, we made sure we had good valves going in without cracks, we showed even if one or two start a crack and liberate, they would be small," Shannon said. "We showed that if it got in the plumbing it's very unlikely to cause damage and then we showed that even if it does cause damage, that damage is not something that we needed to worry about." In the near term, thanks to the valve-related delays, NASA is facing a deadline of sorts with DIscovery. The Russians plan to launch a Soyuz spacecraft carrying the next space station commander and flight engineer on March 26. The docked phase of the shuttle mission must be done by then to avoid a conflict. To get in a full-duration four-spacewalk mission, Discovery must take off by March 13. By giving up one or two of the mission's planned spacewalks, along with off-duty time, Discovery could launch as late as March 16 or 17 in a worst-case scenario. After that, the flight would slip to April 7, the day Fincke and Lonchakov return to Earth aboard the station's current Soyuz ferry craft. But NASA managers are optimistic it won't come to that. Discovery's flight comes at a crucial moment in the history of the international space station as NASA and its partners in Russia, Europe, Canada and Japan gear up to boost the lab's crew from three to six in late May. U.S. astronauts installed new water and urine recycling equipment late last year, gear NASA managers hoped to have fully tested and operational before the additional astronauts and cosmonauts arrive later this Spring. But the vacuum distillation assembly at the heart of the U.S.-built urine recycling gear has failed to operate properly and a 180-pound backup unit will be launched aboard Discovery. Engineers do not yet know what caused the problem with the unit currently installed and they can't rule out the possibility the new unit might suffer the same fate. At the same time, telemetry indicates a subtle pressure problem with the U.S. carbon dioxide removal system on board the station and a higher-than-expected bacteria count in the lab's potable water system. Chemicals to reduce the bacteria count will be launched aboard Discovery and new procedures are being implemented to reduce stress on the carbon dioxide scrubber. Station Program Manager Mike Suffredini says the long-planned move to a six-person crew can continue even if the complex life support systems are not fully operational in May because the lab complex has a good supply of fresh water on board and there are multiple ways to scrub carbon dioxide out of the atmosphere. In addition, visiting shuttles typically transfer around 1,000 pounds of water to the station each time they visit, a by-product of the reverse hydrolysis process that generates electricity in the ship's three fuel cells. Other objectives of the 125th shuttle mission include work to ready the station for attachment of a Japanese experiment platform this summer and deployment of spare parts storage shelves on the station's hull that will be used to mount critical backup components before the shuttle fleet is retired in 2010. The space station's mass will increase to 669,291 pounds - 335 tons - by the end of Discovery's mission and, with eight shuttle flights remaining before the fleet is retired in 2010, the complex will be 81 percent complete. "We're flying the last power truss to the ISS," Suffredini said. "In fact, this is the last major U.S. element built ... by the Boeing Corp. and flown by the Boeing-NASA team and I couldn't be more proud of the performance to date." The solar array truss segment, known as starboard 6 or S6 for short, will be attached to the far right end of the station's main power and cooling truss, which extends at right angles to the lab's pressurized modules. S6 weighs 31,060 pounds and measures 16.3 feet wide, 45.4 feet long and 14.7 feet thick in the shuttle's cargo bay. According to Boeing, the price tag was $297,918,471, which includes costs from a lengthy Columbia-triggered launch delay. 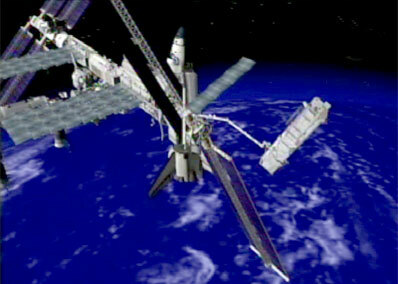 Once attached to the station, its two wings will be deployed, giving the station four panels on each end of its power truss. Total surface area of all the arrays will be roughly one acre, generating 84 to 120 kilowatts of useable power, depending on the time of year and angle to the sun. The S6 truss segment "takes up the entire payload bay, so unlike the last flight (in November), this is pretty much what our focus will be on the mission, getting the element installed and activated and the wings deployed," Suffredini said. "And after doing six wings we feel like we kind of understand them, so I'm hoping this one will be just a normal part of our everyday activation as an element. Of course, it won't turn out that way, but I can always hope." In addition, he said, "this year is our year to go to six-person crew and important to that is not only this truss we're about to fly, but it's also getting all the (life support system) hardware active that we flew up on previous flights. "On orbit today, we've activated two of (four planned) crew quarters. ... The potable water dispenser is activated and operating. We have a slightly high bacterial count the last time we measured the water out of the ambient port. That's not unexpected when we don't use it very often and since we're not allowed to drink the water yet, the crew is not using the PWD as much as we will in the future and normal operation will keep the bacteria count down. So we'll flush that with some iodinated water and clear that up. "The waste and hygiene compartment is working, it's been activated and is working fine. We haven't had any issues with that. The water processing assembly equally has been operating without any issue and we've figured out how to use the oxygen generation assembly (and) it's worked fine as well." Another bit of good news for NASA is the improved performance of the station's right side solar alpha rotary joint, or SARJ. The lab is equipped with two such units, one on either side of the main power truss. Using massive 10-foot-wide drive gears, the SARJ units are designed to rotate the outboard solar arrays like giant paddle wheels to keep them face on to the sun as the station circles the planet. The port-side SARJ has worked normally since its activation, but the right-side joint suffered extensive damage to one of its three bearing races due to an apparent lubrication failure after reaching orbit. Each SARJ features redundant drive gears, but NASA managers did not want to take the drastic step of switching to the backup and losing all redundancy in a critical system. Instead, they began working on a plan to launch and install a replacement, a complex job that would have required multiple spacewalks. At the same time, movement of the starboard SARJ was sharply restricted to minimize vibrations and stress. Late last year, spacewalking astronauts cleaned and lubricated the damaged gear's bearing races and Suffredini said telemetry indicates it now operates almost as smoothly as its port-side counterpart. The starboard SARJ is still considered damaged. But given its surprisingly good performance in the wake of its cleaning and lubrication, Suffredini said engineers have been cleared to operate the drive system in sun-pointing "auto-track" mode when necessary. "Given this data, we're going to release some of the constraints to our ops team," he said. "Today, daily, they go to heroic efforts to manage systems so we can make sure we have enough power to operate the utilization hardware we need to operate. That is, they go in and turn off heaters and other systems every so often when we get to the beta angles that give us power challenges. ... That's an enormous amount of work for the team to do. "So we're going to try to get ourselves out of that position or relieve some of the work the ops team has to do to provide power for all the systems. So what you'll see us do is give them release, such that when we get to those beta angles where we're challenged, you'll probably see the ops team auto-track for a little while in order to get past that hump as opposed to doing all the analysis to figure out what to turn off and how long to turn it off. "In addition to that, we've begun a life test where we'll try to determine how much life we'll have on a degraded joint that's been lubricated," he said. "We're going to try to recreate the system as it is in orbit today and then we're going to put it to an accelerated life test and we're going to try to see if it degrades any further and if it does, can we determine life from that? In addition to that, we're going to try to figure out how often we need to re-lubricate that joint in order to keep the currents and vibration levels down to a level that's acceptable." Testing should be complete later this summer. Engineers now plan to switch to the undamaged starboard drive gear in 2010 and use the current gear as a backup. Playing it safe, however, Suffredini said the replacement ring will be launched and stored on the station for future use if needed. "Because we feel so good about the results so far, we believe we can keep this joint on orbit as the backup joint and perhaps now return to the concept of switching to outboard ops, make some modifications to the system so we can get the necessary redundancy when we go to outboard ops, and have this joint as a good backup," he said. Next up is shuttle Atlantis, scheduled for launch May 12 on a mission to service and upgrade the Hubble Space Telescope. The shuttle Endeavour returns to space around June 13 for a mission to attach an external experiment platform on the space station's Japanese Kibo lab module. Atlantis is scheduled to fly again in late August, following by Discovery in November or December.